Do you have a child who wants a baby carrier just like you have, but for a favorite doll? Have you (or someone you know) just had a second child and the firstborn wants to wear a doll just the way the new baby is being carried? A mei tai, pronounced MAY-TIE, is an Asian-inspired soft baby carrier that can be worn on the front or back. 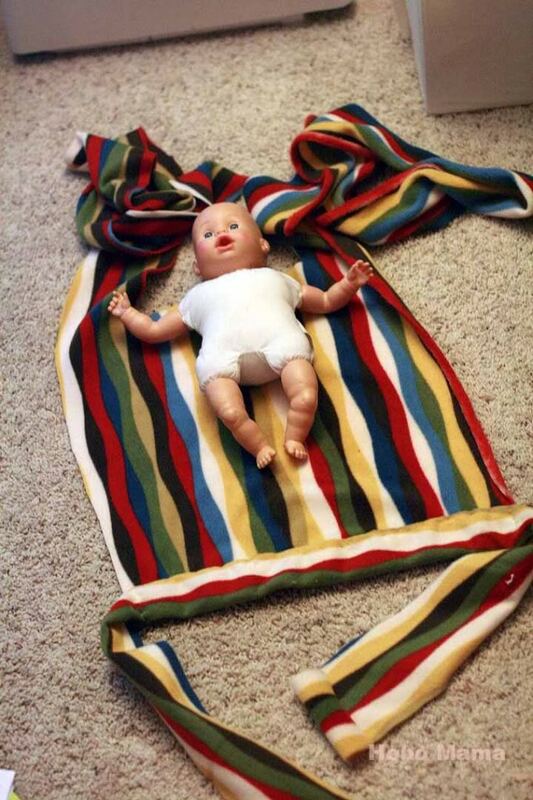 The baby — or, in this case, the baby doll — is supported by a soft apron of fabric. Waist straps tie around the waist, and shoulder straps cross over the shoulders and around to support the baby(doll)'s back. It's very easy to tie on once you get the hang of it! 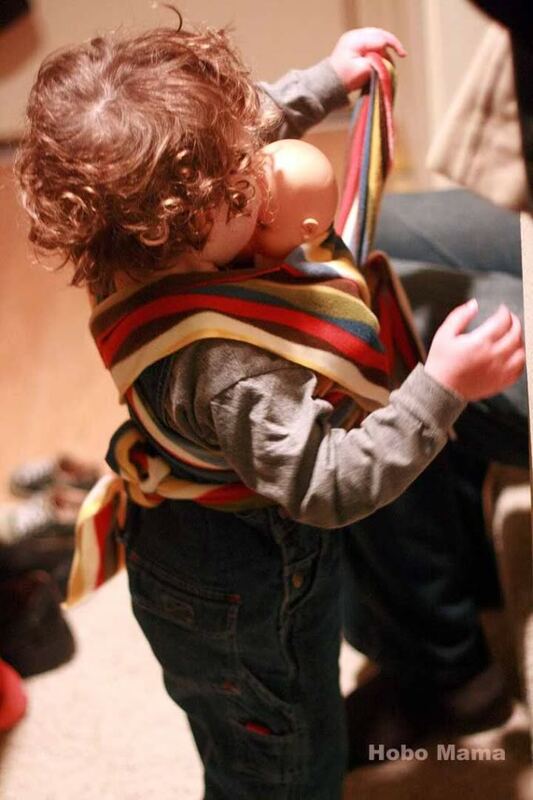 Having a doll sling is wonderful for passing babywearing on to the next generation, and for letting kids imitate what they've seen their parents do. My two-year-old, Mikko, loves bringing his babies places and giving them constantly changing names — recently it has been Baby One and Baby Five — and he's picked out every one of his dolls from the store himself. He also chooses their outfits, as you can see from the picture. Children try on the roles of adults as they navigate their world, and giving them a simple, handmade tool like this encourages them in their role playing. Plus, they get some of the adult benefits of babywearing: having their favorite "babies" snuggled close, and having their hands free to keep on playing! This special Mini Mei Tai is made out of a cushy polyester fleece fabric that is (a) machine washable (hooray!) and (b) soft and snuggly (hooray again!). Those are important characteristics for a child's product, aren't they? 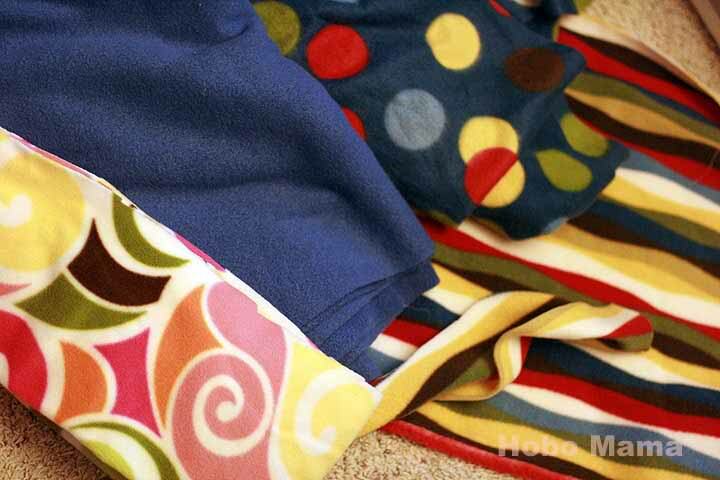 The fleece has a lot of give to it, so you can pull on the straps as tightly as is comfortable for your child. The Mini Mei Tai is in fact ingeniously made from scraps left over from making the no-sew adult version of a fleece mei tai (thanks to a suggestion from Missy). The Mini Mei Tai is crafted much the same way but does require a teensy bit of sewing, which you can see here in the special tutorial on HoboMama.com. I estimate that this Mini Mei Tai will fit very small children and dolls (a year or so old) up through elementary school (maybe twelve years old with an American Girl doll). For small children, you can roll the waistband to make the apron shorter, and even cut down the size as needed: Fleece doesn't unravel, so there's no need to hem. If you believe your child or doll will be bigger than the size range listed, please let me know if you win and we'll see what we can do! I'll be hand-stitching the winner's Mini Mei Tai after the contest closes, so allow a little time for the sewing to take place. If you have a special request, you can let me know then. I'm making the Mini Mei Tai for the winner a little bit smaller than in the photos here and more like my pattern on my Hobo Mama tutorial. If you'd like to give me exact measurements if you win, feel free! Winner chooses from one of these four luscious fleece fabrics (click on picture to see them bigger): Seashore Blue, Stripey Delight, Polka Dot Pleasure, and Pink Swirls! Yes, I made up those fabric names. Please note that the waistband for Pink Swirls might be a little shorter than the pattern in my tutorial because of the low amount of fabric I have for it; if you win and want it and think that might be a problem, let me know. IMPORTANT Safety Notes: Please be clear that this giveaway is for a DOLL version of a mei tai carrier! It is not meant for human babies. It is not designed to support an infant's weight, only a doll's. 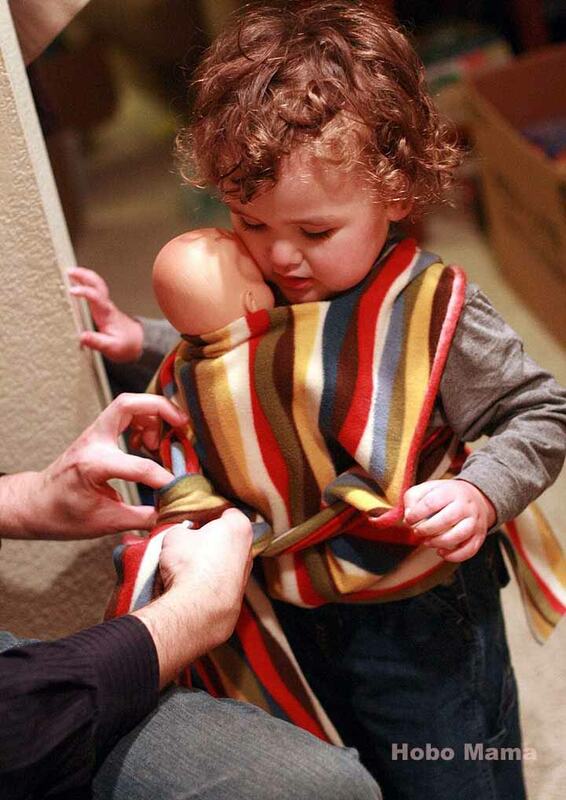 Supervise your child while the carrier is in use, because the long straps may get tangled. Don't let a young child use this carrier alone, and don't let anyone use it to carry an infant. Clear? Tie the waist strap around your child's waist. You can use a knot or a bow. Let the apron of fabric hang down toward her legs. Have your kid hold her doll against her chest while you pull the apron up over the doll's back and smooth the shoulder straps over your child's shoulders. Cross the shoulder straps over her back. Bring the shoulder straps around front and tie behind the doll's back or under the doll's bum. Again, you can do a knot or a bow. You can also check out my instructions here for an adult front carry and the linked video. Here are some alternate carries from a reputable mei tai site. I also have up a giveaway of Mama Knows Breast: A Beginner's Guide to Breastfeeding, by Andi Silverman. I was thinking what a great gift combination this would be for a new sibling gift: a Mini Mei Tai for the older sib, and the breastfeeding book for the mama! So I'm offering an extra entry into this Mini Mei Tai giveaway by entering the Mama Knows Breast giveaway, and I'm willing to do vice versa as well — get an extra entry into the Mama Knows Breast giveaway by entering here. But hurry — the Mama Knows Breast giveaway ends this Thursday, Feb. 25! You can't purchase a Hobo Mama Original Mini Mei Tai, because you can't put a price on the adorableness. Or something like that. Make your own Mini Mei Tai or No-Sew Adult Mei Tai following each easy how-to on HoboMama.com! If you make the adult version, remember to save the scraps to make doll versions afterward! All you need for the adult version are heavy fleece, a measuring tape, and scissors, so give it a try. For your chance to win a genuine Hobo Mama handmade Mini Mei Tai, enter in the comments below! Contest is open worldwide because you know I love you all dearly. MAIN ENTRY: Tell me which child would use this Mini Mei Tai if you won. Tell me which doll would use this Mini Mei Tai if you won. Enter my giveaway for Mama Knows Breast, a wonderful breastfeeding guide by Andi Silverman — but hurry, because that contest ends Feb. 25! 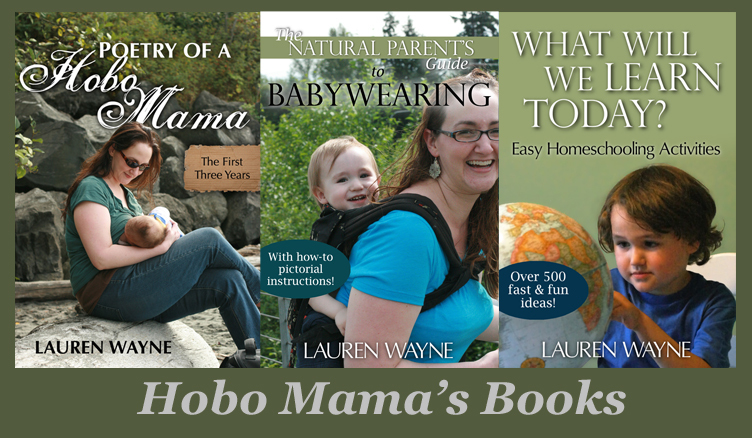 Do something lovely for this post or a post on Hobo Mama (StumbleUpon, Twitter, Facebook, Digg, Technorati, etc.) and let me know what it was and which post in your comment. There is a Share button below each post to make things easier. You can gain up to 3 entries this way. I will pick the winner through random.org after the contest closes and send an email notification. Leave an email address in your comment if it's not clearly visible on your profile or linked web page so that I can contact you if you win. If I can't reach any particular winner or don't hear back within a couple days, I'll draw a new name. Contest closes Mar. 18 at 11:59 p.m. PST. two hands using materials I had purchased. I'm so entering this. If I win baby Susie (we have 1 doll) is going out in style alongside baby Josephine. I totally follow you publicly. I'm sending you a photo of Baby Jo in her real-deal version. Love it. Love the stripe pattern. My son lives in his carrier. We have a Boba, which is similar to Ergo. I am a loyal customer to NAP, who makes Sleepy Wrap and Boba. Babywearing rocks. I think my son would love to dollwear. His dad wears him often. Thanks for the great blog! I'm going all out for this one! The fabric I like is the swirly-girly fabric. I'd give it to my youngest daughter because she is so much more likely to wear it. She's wear Baby Emma in it hand's down. Or maybe princess baby. Or maybe both. I follow you at Hobo Mama. And now I follow you at Hobo Mama Reviews (but my icon/avatar looks different here) don't ask me why but its the face of my regular twitter icon. The painting. I'm posting this post on Facebook too. Ooh. I get three entries for that one!?! Cool! This is #1. I'd give this to my 2 year old. She'll have a little brother next month and I'd love for her to be able to carry around a doll just like I carry her little brother! I'm pretty sure my daughter would be carrying around stuffed animals more than dolls in her carrier. She's been carrying them around and saying she's taking care of her babies but doesn't really do that with dolls! Margaret only has one doll and her name is "Doll," so Doll would be worn in it. How creative are we? My daughter Emma would love this. She's almost 4 and loves playing Mommy. My daughter would probably use this with her Lucy doll. My daughter would love this for each and every one of her babies. Great giveaway! My daughters Lily baby would use this! My 3 year old daughter will be using this. She loves being a little mommy. Baby Molly will most likely be the baby she carries around with this. MY almost 3 year old son Sebastian would love this since I carry his baby brother in one all the time! My daughter would def. be using this sling, she's all about taking care of her doll! I think It'd be a toss up between Tommy and Baby Bow who gets to use the sling! My 4 year old daughter would LOVE this. She's always attempting to make slings out of her brother's swaddling blankets! Well...my daughter is only 6 months, but I'd love for her to have this to play with one day! She can use one of her "my first dolls". My little Bean would love this! She's two, and either Teddy or her baby doll Sookie go everywhere with her. I love it! I'd choose the stripes for my son to use. Thanks for the chance! My son loves his baby dear these days, so I'm sure he'd put that in the MT first. My son would love this for his "Baby". This would go to my DIL's niece. My daughter would use this for Ella Poupella. The doll would be Ella Poupella, it's Waldorf doll I made for my daughter. Thank you for explaining how to post proof of a tweet. I always wondered how people did that. This would definitely be for my soon to be 3 year old niece. I could so see her carrying her baby dolls in it. So cute!!! As to which child would use this? I've got two! They are a wee bit tiny now, at seven months, but we planned to somehow schnagle them each a child sized sling for their first birthday! Adorable! My 2 1/2 yer old would love it. Sadly, I haven't found time to make him one, so he is always trying to borrow his borther's or sister's for his "baby"
I'd love to win this for my one-year-old son! And I just friended you on FB! I want to give it away!! I am giving a MT to a mum with a beautiful 12month old girl. I would love to give her this as well!! Following hobomama on my RSS feed (even snuck into my bedroom to get the iPhone of the bed where my beautiful 4 month old (teething) daughter was sleeping! Tried to enter the book giveaway.. I was too late.. but I am checking out the book anyway!! It would be for my sister's foster daughter. Tried to comment the other day, but don't think any got through? So: I totally follow you on twitter, my tweep. Added you to my google reader, which I meant to do anyway. This site and your main bloggy too! Now a fan on fb, too. Not sure how you validate that, but am happy to tell you my real name. Just not in public. Ha. Which doll would use this....ooh, tough one. My babies are 7 months and we planned on getting them some baby slings for their first birthday. Seeing as how they are already fighting over toys, I'd have to nominate several dolls based on their current faves. :) Namely, a stuffed bunny rabbit and a blue hippo. Erm forgot to leave the two bloggy subscriptions as two different comments, so can this count as one? Just tweeted this and cannot figure out how to put a link up to a specific tweet. Your stupid (amazing!) contest is forcing me to face my technological insecurities. I want this mei tai so so so badly. Times two. Ha. Oh my gosh that is the cutest thing EVER. My daughter Lily would love to wear her babies in that.